Many of the people investing in shares can manage their investment via tools provided by their Brokers. In addition, there exist a huge number of software providing latest share prices and all kind of technical analysis data. And even many portfolio management tools are relying on retrieving and updating information from online sources. Especially “Yahoo! Finance” is widely used information source. Jstock and stock-portfolio-manager (no installation required) are open source examples. Surpricingly there are not many portfolio tools for markets which cover the offline sources. The method presented here is targeted more for markets where online resources are not easily available. Or to situations where one would like to have one simple way for portfolio management. For other situations, one need to perform comparison of tools. The excel template by Microsoft called “Stock investment performance tracker” might provide base for your own easy portfolio management. The figure below shows an example, with fictious data filled in and the currency symbol changed into Euro. 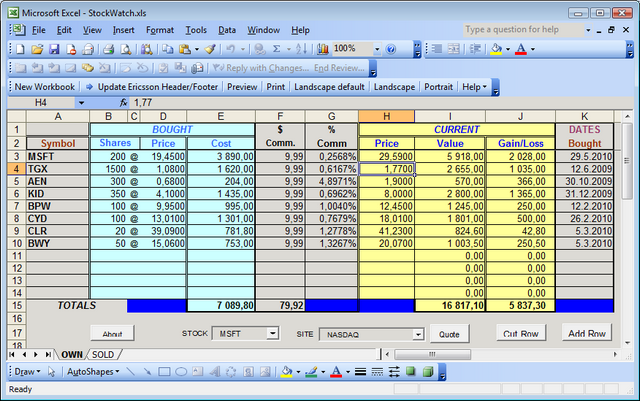 StockWatch provides a more mature Excel based alternative. The approach is good. The only minus is the distribution via installation. 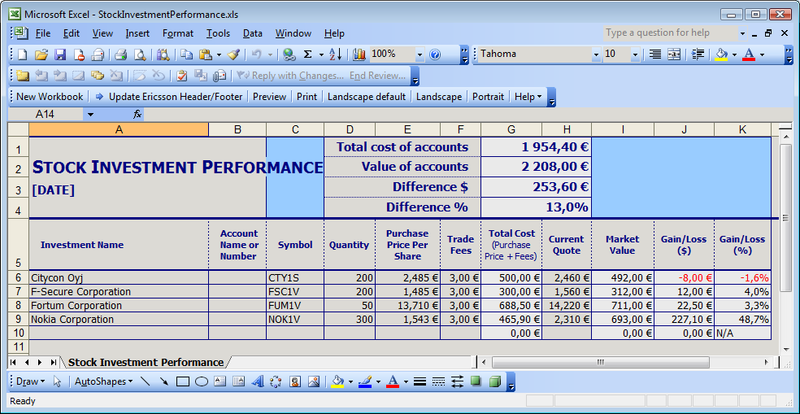 By combining the ideas from the 2 above, one can easily develop your own excel. As mentioned, these excels are targeted for situations where data is feeded in manually. 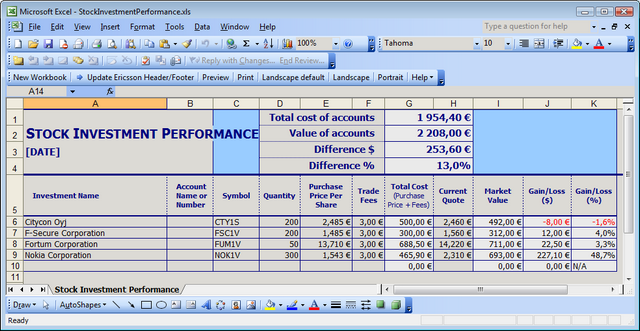 However, by using Autoit scripting tool one can update share price and history information on these excel sheets automatically!